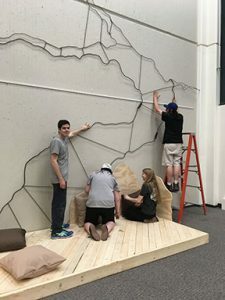 Illinois State University students work on the “Industrial Nature” sculpture on Milner Library’s second floor. When you walk across the Quad on a nice day, you see students studying under trees. Art Professor Claire Lieberman’s Sculpture II students observed this study habit, and wanted to bring it to one of the other main places students study on campus—inside Milner Library. 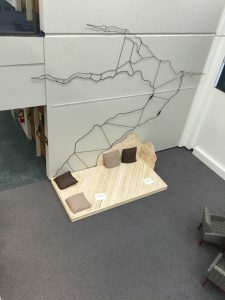 The full sculpture, as seen from above, at Milner Library. Their concept of bringing the idea of nature indoors is meant to let tension melt away in the same way studying under a tree outdoors can. The tree is made from steel the students heated, bent, and welded together, and is meant to resemble the shape of a bonsai tree. The deck it is coming out of is made of wood and built like the deck of a house. The artists would like to encourage students to use the tree and deck to study—and even write on the wood part! It was created by Jason Engels, Carly Engle, Matt Limon, Morgan Stone, and Tyler Wolf.